Recently, I was free motion quilting a baby quilt and I was interupted by skipped stitches. Everything would be perfect for a few inches and then I’d have to stop and rip. Since quilting is supposed to be fun (and this wasn’t), I did some research, started experimenting, and finally fixed the problem. Here’s what I learned – along with some words of wisdom from a few of my quilting friends. The needle holes show where the stitches were skipped. 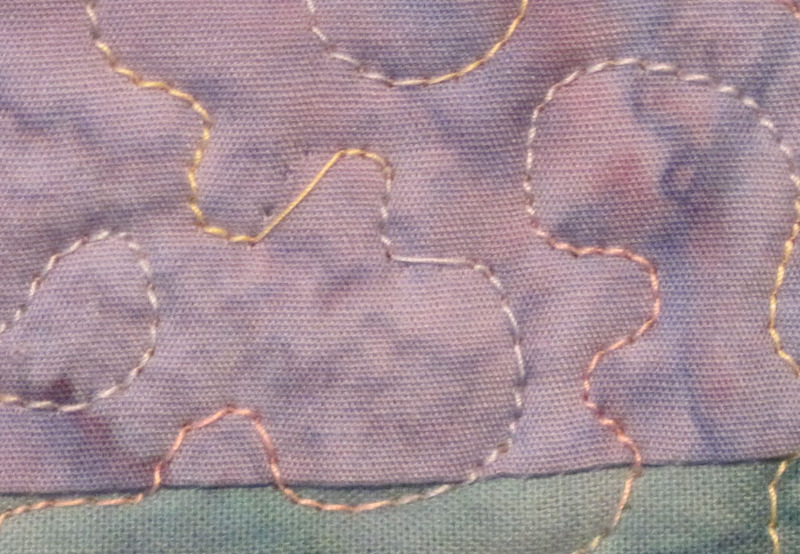 In free motion quilting, skipped stitches are when the needle carries the top thread into the quilt sandwich, but the thread does not form a stitch. The needle may leave a hole when it pulls out of the quilt, but the top thread also pulls out of the hole. Skipped stitches can come one at a time or several in sequence. I have a tolerance for one here and there, but groups look bad and I rip them out and try to figure out what’s causing the problem. As you make adjustments to solve the skipping problem, remember to change one thing at a time and test on a quilt sandwich that matches the quilt you’re working on. Michele Scott also suggests trying a single hole or straight stitch throat (stitch) plate. The smaller opening leaves less room for the quilt to flap as the needle punctures the quilt sandwich, pushing it down and pulling it back up. Reduce the top thread tension. Start with small changes, but don’t be afraid to approach zero. Just keep checking where the stitch locks (top thread with bobbin thread) to make sure you’re fixing your skipping problem and not causing a tension problem. Make sure your feed dogs are down. I know, but check anyway. If you can’t cover them or lower them, then set the stitch length to zero to keep them from moving. Make sure the needle is inserted completely and properly. Clean the bobbin area and make sure there are no errant threads hiding there. Oil, if appropriate. Victoria Findlay Wolfe, artist, quilter, and owner of Bumble Beans, Inc., suggests getting rid of all those dust bunnies hiding under your throat (stitch) plate. You may be surprised by how many you find! Shannon Shirley, an award-winning quilter, says she gives her machine a good cleaning. Sounds like a great idea! Use quality thread. This will cut down on lint (bonus!) and make a nicer stitch. Try a different size thread. Sometimes really small threads can be too small to be caught by the hook. If this is consistently a problem, take your machine in to be serviced and explain the problem. This is an easy adjustment. Try a thread that’s one step larger to see if this is the issue. According to Kathy Lincoln, who teaches machine quilting, some batiks grab the thread fiber, interfering with good stitch formation. 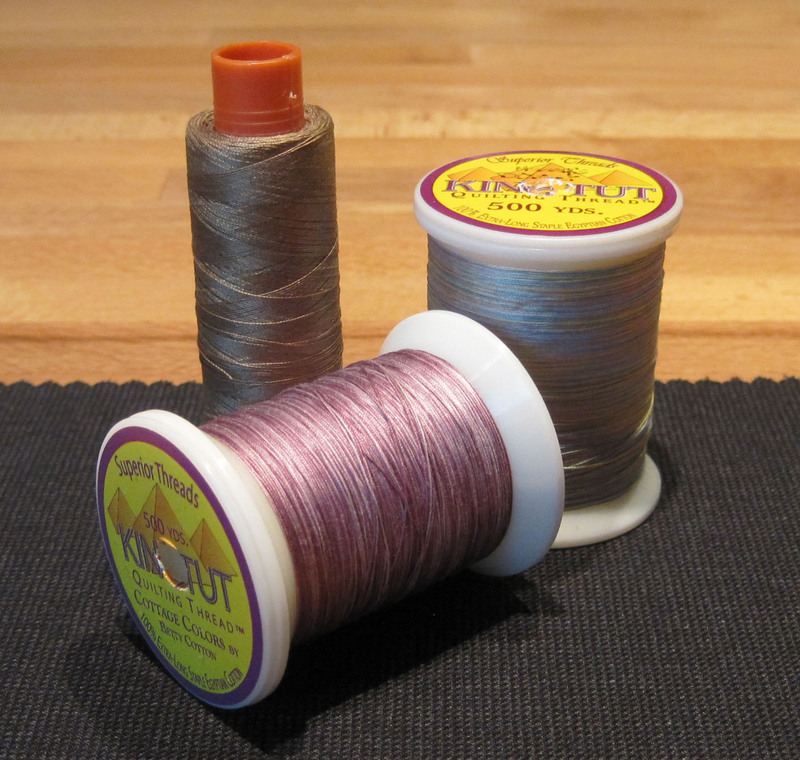 If batiks are giving you trouble, trying a finer thread could be the solution. Dull or damaged needles can cause skipped stitches. Change your needle. Use the right needle for your machine. I like Schmetz for my Bernina. Microtex/Sharp needles work well with tightly woven fabrics, like batiks. 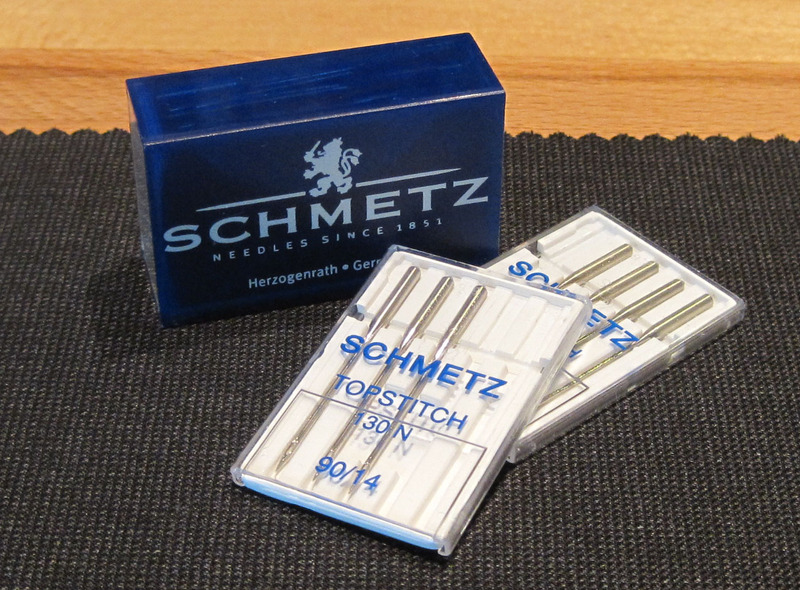 Topstitch needles have a bigger eye, which can be helpful if you are using larger thread. Needles that are too small can cause flapping (why do they call it flagging?). Start with 80/12 and move up from there. Kathy Lincoln says this about needles: It may seem counter-intuitive, but try going from a sharp point to a ball point needle. The ball point will separate the fibers instead of cutting through them. Start with whatever foot your machine manufacturer recommends. Generally, a darning foot is fine. My Bernina foot #15 is my go-to foot for free motion quilting. If flapping (flagging) becomes an issue, go for a foot that has more surface area, like Bernina’s #44. 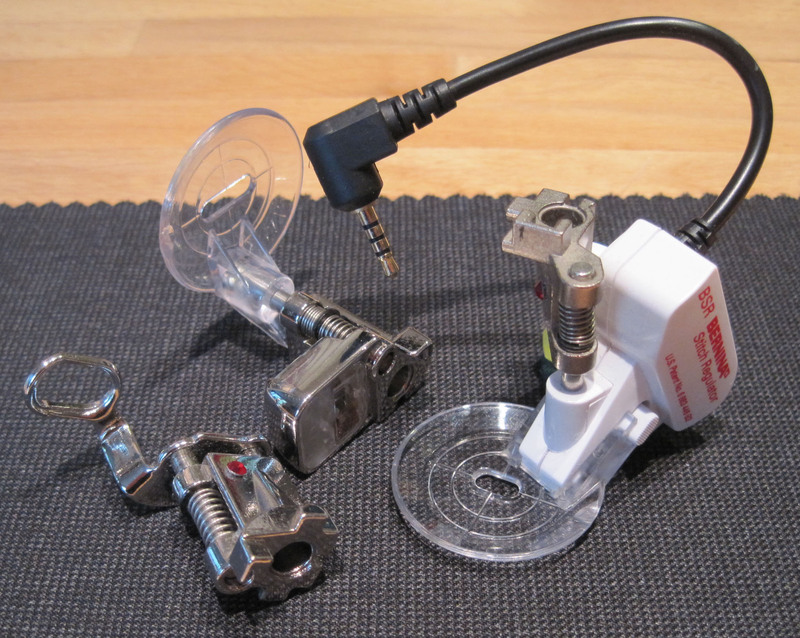 If you’re using the Bernina Stitch Regulator (the BSR), use the clear plastic sole. The idea is to provide as much coverage around the needle as possible to cut down on flapping. If the skipped stitches are caused by flapping, then increasing presser foot pressure can help reduce the flapping. While the presser foot does not actually ride on the fabric while you are free motion quilting as it does in regular sewing, increasing the pressure can limit the space within which the quilt sandwich can flap up and down. Change presser foot pressure in small increments (On my Bernina, I change in increments of 5, starting with the default 50 setting) and test, test, test. For the batik baby quilt, I finally fixed the problem with a presser foot pressure set at 85. Don’t push the fabric too fast. If you can’t slow your hand speed, then increase the machine speed. Use your hands to keep the target section flat and firm (but not stretched or tight). I keep my hands flat, fingers at 12:00 and thumbs pointed toward each other at 3:00 and 9:00. Think of the stereotypical film director framing a shot with his hands. The area between my hands is where I stitch. Yes, you have to reposition your hands pretty often and, yes, it’s worth it. Try to keep a steady, consistent speed. Make a test sandwich out of the same materials you are using in your quilt. Test before you move to the quilt. Seriously. I like to skip this, but it’s best to play it safe. Use it to test tension and stitch quality. I have an anonymous quilting buddy who says she switches off her machine and heads to the kitchen for an adult beverage. Hmm. That sounds like a plan. Take a break and start fresh later. If nothing here works, then your machine timing may be off. You may need to take it in to your machine tech for service. Be prepared to sew at the shop and demonstrate the skipped stitches. Take your quilt or the test sandwich with you to the shop. My baby quilt has a batik top, batik backing, and thin cotton batting. I was quilting on my Bernina 820 with Superior Threads’s King Tut (cotton 40-weight thread) in the top and Aurifil Mako (50-weight cotton thread) in the bobbin. The winning combination was a 90/14 topstitch needle, 1.25 top thread tension, the Bernina Stitch Regulator with the clear plastic sole set on BSR 1, and the presser foot pressure set at 85. Now I just need to finish the binding! 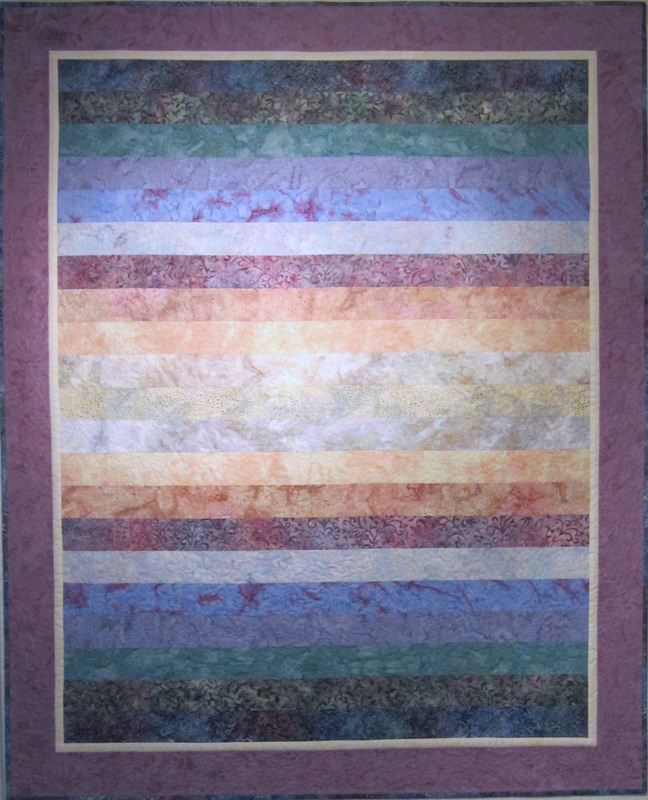 For more information about this quilt, read my previous blog entry. Thanks, Sherry! I just hate it when I get skipped stitches — and I had a feeling it might be something others experience too. I’m so glad you liked it! This is so useful. Thanks for all the homework you did for the rest of us! Thanks, Anne. I hope it’s helpful! Thanks so much for this, I am printing it! I have had problems off and on with my Bernina 820 so it’s good to read about someone who has solved their problems with it. Thanks for your comment! I wouldn’t say I’ve solved my 820 problems completely, but I’m closer to it. The 820 is a monster machine and I think it takes a while to learn all of the adjustments and nuances. As Bernina says, it’s a sewing computer. I just love working with it. Great post! So many great tips!! I also have an 820 and am consistently frustrated with the BSR free motion quilting. The really frustrating part is that I feel like I start at square one with every project in terms of trouble shooting the stitch. Just when I think I have it figured out, the next project (same thread, same needles, clean machine, etc.) goes wrong. I would like to have back the time I’ve spent trouble shooting. OR I’d like to have my 440 with a nice big opening. 🙂 Never a free motion problem with that machine. Thanks for the comment. I agree; we do start over with each project, but I’m not sure that’s a totally bad thing. I think the 8 series Berninas are sensitive, but I believe the advantages (lighting, speed, extra space, and adjustments) make them worth it. Are you having other 820 issues? A great post, I think from time to time we need reminders to check our equipment – thank you. Thank you, Miche’le, for your comment. I agree. This information is very useful since I had this very problem with my last quilt. It took forever figuring out what needed adjusting and how much, but finally I got it. I have a question that I cannot seem to find on the web anywhere, have you ever heard of anyone doing a zigzag stitch as you with in the ditch stitching. Instead of straight stitching could I do a zigzag type stitch or would it look weird? I have only made one quilt but am going for my 2nd one and just wandered if this would work. If you have an opinion about this it would be very much appreciated. 2 1/2 and the width at about two if I remember correctly. It’s best to do a test strip to see how wide you want you stitch path to be and how long you want each stitch. Thank you for this information – I was starting to think it as user error. I am going to change the thread in my bobbin which is a thinner weight than what is in my needle. I have the bernina BSR but since I learned how to free motion without it, I don’t like to use it. I would rather just reduce the pedal speed on my aurora 440 and just sew. I have struggled with my thread tension during free motion quilting as well, keeping my upper tension sometimes as low as 1 or 2. When using two different contrasting colors for my upper and lower threads I struggle to find the right combination of tension above to prevent either thread from showing through to the other side. Thanks for this info. I am going to try switching out my thread and see what happens. Sorry for the delay in answer this. I didn’t realize your comment was here! I’m sure you have already made the necessary adjustments to fix the issues you were having, but I would just say this: don’t be afraid to reduce your top thread tension even lower than 1. I’ve sewn with the tension at .25. Sometimes that’s what you need to do to avoid thread pop or just to make two different threads work in harmony. Your machine is a tool and you can make whatever adjustments are necessary to make it work for you. Thanks for the comment. Here’s some information you might find helpful. To adjust the presser foot tension, find the presser foot tension button on the home screen. On my 820, it’s on the 4th row just to the right of the top thread tension button, which looks like a thermometer. It looks like a presser foot with an arrow pointing down with a number. My default presser foot tension setting is 50; that’s the number on the button on my machine. Touch the button and make the adjustments on the following screen. I’ve never adjusted the stitch length for the BSR, but I believe you do it as you normally would using the bottom silver knob to the right of the touch screen. For it to affect the BSR, I believe you have to adjust the stitch length while the BSR is engaged/plugged in. Best of luck! Let me know how you make out. I am so happy to have found your post after an afternoon of ripping stitch after stitch… So frustrating. The strange thing is this problem started two quilts ago. Prior to that no problems at all. I took my machine in yesterday for routine cleaning and my BSR needed updating. I thought that would solve my problem. I have a Bernina 430 and use quality thread. When I use a small test sandwich it works fine. I get excited, put the quilt back on the machine and am able to go at most two inches. One question I have, I am using a quality micro fleece backing which I have used before with success. Any suggestions with using this fabric? Also, the thread I’m using is YLI machine quilting thread. If its the thread I’m concerned about changeing it midstream as that might be very noticeable. OMG… After trying your suggestions it now works properly. What seemed to be the fix for me was to change to the clear foot. I also changed to BSR1 and then back to BSR 2 which also helped stitch consistency for some reason. THANK YOU SO MUCH! I can’t wait to do free motion quilting on this piece once again!!! Vanessa, that’s great news! I’m so glad you’re back on track! Thanks for letting me know. I was searching for some troubleshooting help with my 820, and was so happy to read your post. I am frustrated with the machine for the same reasons mentioned before, and with the lack of info in the owners manual. I am going to try everything you mentioned and retackle this quilt, which is a wedding gift, and i have had to rip out 1/4 of the stitched for the bottom was too loose. Advise? Linda, I’m so sorry you’ve had this trouble! I hope you’ve met with success since you left your comment, but just in case, I have two thoughts for you. When you say the bottom was too loose, that means two things to me. 1. If the bobbin thread is loose enough to “pop” up to the top and be seen, then the machine tension is off. When this happens, the top thread looks like a straight line and the bobbin thread shows up as tiny dots at each stitching hole. Even though it looks like a bobbin problem, this is usually caused by the top tension being too tight. Loosen the top tension (work slowly and loosen it in small increments) and test the new tension using a quilt sandwich of the same materials you are using in the wedding quilt. On my 820, I sometimes use a top tension as low as .5. As long as the stitches form properly, the number does not matter. 2. Sometimes the bottom of the quilt is too loose and looks like a bird’s nest of thread. This, too, is a problem with the top thread. In this case, you need to rethread the machine with the top thread. I know it seems illogical, but it’s true. With the Bernina 8 Series, it’s easy to miss the tensioning system along the top. Your aim I fine, I’m sure, but the machine takes a moment to be ready to accept the thread properly. When you slide the thread up into the slot on the right (immediately next to the thread holders), do you hear the machine making adjustments? It’s opening the tensioners so your thread goes into them rather than resting on top. Slide your thread into that slot on the right and then wait until the machine is finished preparing. You’ll hear the mechanical sounds start and then stop. Then finish threading. One last thing. Sometimes we’re in a hurry and we forget that the presser foot must be in the up position for the tensioning system to properly accept the top thread. Just make sure the foot is up. It’s SO frustrating when everything is going according to plan and then it isn’t. I had issues hand stitching through paint once, but I have not experienced what you describe. If I had to troubleshoot, here’s what I’m thinking. Since you replicated the problem with a second sewing machine, the machines are not at fault. I think you’re right to suspect the needle. I don’t tend to use universal needles, although I know many people do. I feel that the universal needle cannot be good at everything; I choose needles specific to the job. For quilting, I generally use denim or Microtex needles. They are sharp and have a decent size groove to protect the thread from shredding. I think you had the needle size right. If a denim or Microtex 80/12 didn’t work, I’d probably bump up to a 90/14 to see how that might work. This is a great article for a beginner like me. I also have a problem with my stitches on the back as they are pulled when I make a loop. Margaret, I used to have that problem on the back. For me, I realized that I was rushing the loops. If I can keep my speed consistent, then the tension issues on the back were minimized or disappeared completely. Consider speeding up your stitches; that might help. I have the Pfaff Grand Quilter 1200 with a grace frame, I practiced before beginning a quilt, it was perfect, when I started on the actual quilt it skips stitches every so often. I am frustrated and ready to throw it out the window. I have cleaned everything, changed the needle, cleaned the wheels and tracks, and changed thread. Someone please tell me what to do, even a friend of mine that has a pfaff long arm could not figure it out. I think frames bring in a whole new set of problems with quilting. I’d make sure the quilt sandwich is taut enough. Also, changing the needle is fine, but try changing the type of needle to accommodate the type of thread you’re using. I hope this helps. Thanks, Michelle! I’m glad it helped! OMG I have this same issue….. Thanks Michelle Royce for making me aware of this very informational piece of website. Another issue I have… is while I am FMQing my thread will shred just above the needle where it threads into that little wire before it goes down into my needle. Eventually the thread breaks and I need to rethread. What is causing this problem? Moonlighting Quilts… you are amazing…. that’s for all of the information…..
Craftydee66, I saw your post on my FB page and answered there, but here it is again. I hope something here helps solve the shredding problem. * Different size or type of needle — If you are using thicker thread, you’ll need a larger eye and perhaps a larger groove for the thread to hide in. Try a jeans or topstitch needle. 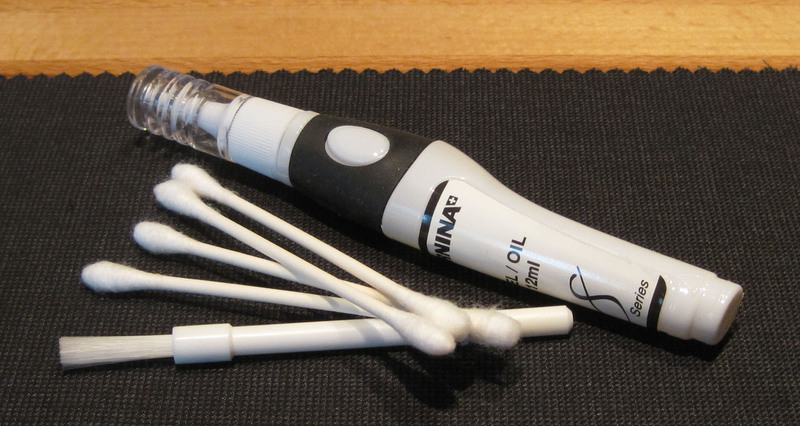 If you are using metallic thread, go for a needle designed for metallic thread, but skip the lubricant. * Try fresh thread. Sometimes thread gets old (on our shelves or in the store where you got it). Old thread tends to be weak and shred. * The thread guide above your needle has two metal guides, useful for when you are using two threads in a regular or twin needle. It’s possible that one has a burr. Try using just the front one (the one that looks biggest). If that causes shredding, then try the one behind that looks like a single thick wire. Great post. So informative and helpful. Thank you. After FMQing several throw size quilts, on a new throw I have had nothing but problems with skipped stitches on my 830 LE. I jotted down on these suggestions and am going to work through them. This problem has really put a damper on my quilting and I hope I can find the problem. I am using Aurifil 50 and this particular spool gave me problems before. Since I saw this on the list, that is the first thing I am going to change. Could it be wound wrong?? Also, I am changing to a single hole stitch plate. Not sure if I have FMQed with a particular stitch plate in the past, but it is worth a try. And, I am definitely changing my needle, again. Thanks for the ideas. Hi Marty Mihm Day, I’ve had a whole new education since owning an 830 and getting to know it and now getting to love it. When doing FMQ I only use the single hole stitch plate which I’ve never had till this machine, also I’ve learned that this machine is quite fussy with which threads it will and won’t accept – for example – it will use Gutterman and Rasant, but won’t take cheaper brand threads, also won’t take some of the more expensive embroidery threads that I’ve previously used (a little more info than you need). I also use my BSR but use the No. 1 setting as I’m not fully confident yet. I hope this is of some help. Thank you for helping me in my desperation. I was skipping more stitches than I was sewing. I tried all your suggestions, including the adult beverage, and the one that finally worked was the presser foot pressure. Never in a million years would I have thought to try that! I learned a lot. Thanks for all of your detail. This gives me lots of options to strive for perfection. I got the BSR because I wanted my stitches perfect. Those skipped stitches really disappoint. Thank you!